WINNER UPDATE: Congratulations to Jason Nickolay! Lucky winner of the cookbook giveaway! I finally got my 1st recipe idea down to an edible dish. To those not on the know, part of being a Brand Ambassador for Kellogg's Rice Krispies Treats is to take on the challenge of creating a winning recipe for the Summer Edition of the Rice Krispies Recipe Box Challenge! Where if lucky, my recipe will be featured in RiceKrispies.com! I'm hopeful - and crossing fingers and toes. Just like Iron Chef and Chopped, we have a SECRET ingredient! Our secret ingredient which we decoded on Twitter is "cooler" which represent anything frozen or cold. Ok people, seriously, it's a tough one! But I'm pretty confident that this first recipe idea is brilliant! Presenting Rice Krispies Treats Ice Cream cup! A very simple, easy to make dessert recipe. Even a caveman can do it! (yes they can!) My fabulous 6 year old daughter was a great helper elf in this mission and we both had fun doing it! Below is the video tutorial which explains and shows the simplicity of the recipe. 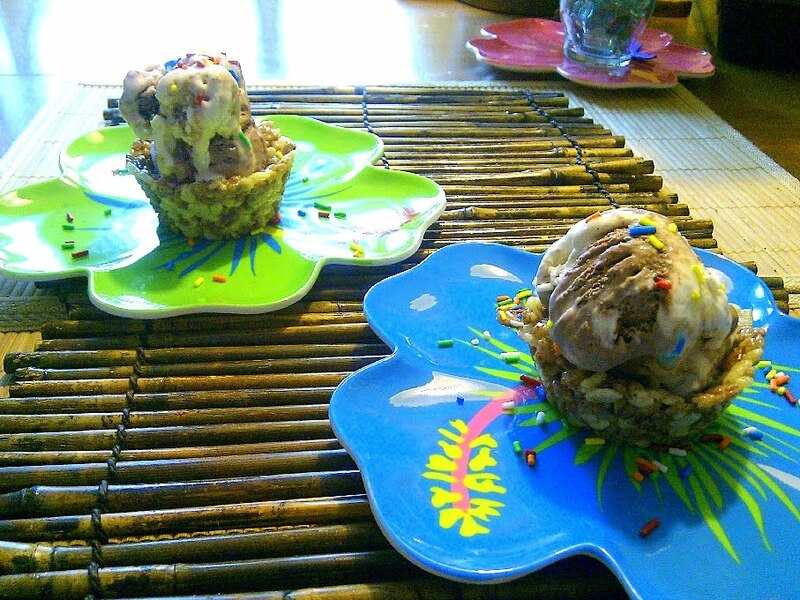 Tidbits: The batch made here was half of the recipe which approximately made 6 Rice Krispies Treats cup. You can top the ice cream with anything you want including fresh fruits or syrups (caramel/chocolate). You can also incorporate different flavors to the marshmallow base as desired to add zest to it. Orange worked great on this recipe. And if I must say so myself, this recipe is SO YUMMY in the tummy!!! The Fun Part: You get to win a Cookbook! One lucky reader of Zen MamaVentures will win one Rice Krispies TreatsTM Cookbook as part of this challenge! See Official Rules Here. Deadline: Friday, June 24th, 2010 @ 5:00PM EST. You must leave your email address so I can notify you if you win. Winner will be announced no later than Monday, June 28th . Random.org will be used to select winner. Open to US addresses only, 18 years and older. Winner will have 24 hours to response or another winner will be drawn. Giveaway Sponsor will ship the item to the winner. Goodluck everyone and watch out for my 2nd recipe, then let me know which you like best! I am a gfc follower. I love to make rice krispie treats, and I collect cookbooks. I would love to add this one to my collection. we love making yummy finger treats. This would be great for my daughter and I to do together. I follow through my yahoo feed. This looks great and would be a fun activity for the kiddos! I subscribe to Zen MamaVentures RSS via google reader. I follow on GFC. We love rice kispies.